As the run up to PLASA continues, companies are doing 'sneak peeks' of new products or showing them close up to people that may not get to the show. 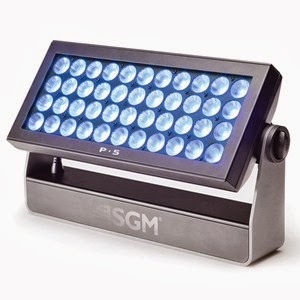 I was lucky enough this week to be given a demo of the new SGM P5 LED Wash as well as other products from the range - an RGB Strobe and a white Strobe that rivals the Martin Atomic (but without the power requirements!). The P5 is an IP65 Rated unit if you need to use it outdoors and there's a handy fan pack which fits to the back if you use it inside (the fan pack derates the unit to IP55). It's an RGBW unit so that you can mix nice pastel shades as well as the strong vibrant colours that you can achieve with LED's. As with the products that preceded it with SGM, there are interchangeable lenses available to change the beam angle. The unit I saw had the 40degree lens fitted, so it gave a very good rendition of a 1kW Fresnel beam and the brightness looked about equivalent. It comes with a variety of hanging options too or you can just set it on the floor to uplight a wall or building. It also has built in wireless DMX, so if you do want to light a building then you only need to worry about power cables. Having been a fan for many years of the Palco series, I have to say that this unit restored some faith for me in the SGM name. The unit has been designed and engineered by the R&D team that used to work for Martin so takes in to account things like useability and flexibility - the unit even tells you the next DMX address to use when you configure this unit, I don't need to count on my fingers anymore! If you want to read all the specs for this unit, then there's more detail here along with its 'sister' units - a white flood the P5W and the stunning strobe the X5. Apparently the P5 is making its way in to the hire stocks of PRG and White Light and a few others, but being honest it's not something we would necessarily carry in hire stock but I daresay we could sub it in for you. We can sell the units though, if you'd like to have an indication of pricing then please call our sales desk.